The Royal College of Music Junior Department (RCMJD) is 90 this year. The Saturday school for committed and talented 8 to 18 year old musicians was founded in 1926 and is the United Kingdom's oldest junior conservatoire. On Sunday 10 July 2016 there will be a celebratory gala concert at the Cadogan Hall. 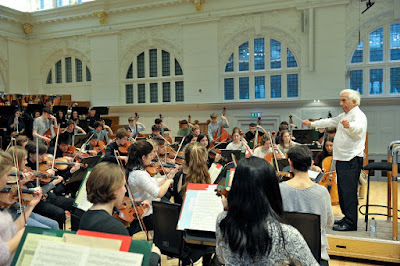 Peter Stark will conduct young musicians from RCMJD in a programme which includes Stravinsky's Rite of Spring, Schoenberg's Verklärte Nacht and Malcolm Arnold's Homage to the Queen which was originally written for coronation year and is being revived in celebration of the Queen's 90th birthday. RCMJD welcomes around 300 young people each year and distinguished alumni include pianist John Lill, clarinettist Michael Collins, and composers Mark Antony Turnage and Gabriel Jackson. Full details of the concert from the Cadogan Hall website.